The following is a guest post from D.S. Amar. She writes about one of those experiences she had abroad that all of us perpetual nomads long for and feed off of – pure in-the-moment travel bliss. A disappointing sign on the door read: Otevreno: 19:00/Zavreno: 24:00. My limited Czech did not hinder my understanding that we were simply too late; it was 23:55 after all. But outside the cold numbed my face and I was desperate to get into the warmth, and though iron shutters covered the windows and the door told us to go home, I opened it anyway. I had been here once for coffee and small talk during the first few blurry nights in this new country, but it was blurry and I was so new. This time I was really there. Walking in together to hear the familiar sounds of Bob Dylan lilting throughout the spacious room, my friend and I immediately felt grateful for our spontaneous decision to come to Shakespeare & Sons. It is a quaint bar and bookshop hidden between boring buildings a few blocks from our dorm on Machova. “Tambourine Man” filled the space with rhythm and even more soul. The music did not fade into the background, as it sometimes must, it resonated and passed through the lips of the people standing around, between sips and smiles. Behind the bar stood Viktor, a young face smiling out the wisdom and ease only a bartender at a place like this can obtain, after countless nights of English lyrics and unfiltered Czech conversations, shared with him in times of despair, mediocrity, celebration. He was planted behind the bar but as much a part of the conversations as the potions he had conjured up and poured inside them. Viktor nodded us to the only table in the back corner, next to spiraled bamboo shoots and a tall bright reading lamp that lit up a pile of dusty books on topics we could not recognize or understand on our own, but might have told stories of Czech legends or the science of love or other great things. Viktor brought us svarene vino, aromatic spiced hot wine that has recently become a favorite past time of mine. There we sat, among the books and the Czech, and the American tunes for the coming hours of the cold February night. At the table closest to us were three chess players, two of which were in love (though I was unsure if they both knew it yet) and the other sat waiting his turn. There was an air of sweetness around the players; it was in their eyes when the other was not looking that gave their secrets away. The lovers ended their game with shy smiles and deep breaths and surrendered the pieces to their friend, who revealed an American accent as he offered one of us to play. Though neither of us could oblige, we were pleased to hear him tell us he had understood us all along, and that he was from Maryland. We might never have known, the way he spoke Czech and laughed along, he felt home. Looking in, a shivering passerby might have guessed that Shakespeare & Sons had retired for the night; the chairs sat on the tables and the lights were dimmed to the point just before complete darkness—a seemingly empty room void of those vital signs of bar life; wine glasses being lifted and kissed, cigarette smoke reaching the enormous ceiling in spiraled waves and wobbling O’s, tapping feet and nodding heads singing along—but it was all still there, behind the iron shutters it was still happening. Perhaps these fleeting after hours that had closed us all in and kept everyone else out (the shivering passerby would not have attempted to try her luck at this point) were what made this place so intimate and all right. Or was it in the fact that my purse was not glued to my side in fear of being pick-pocketed, the key to my dorm 3 blocks away safe inside? Inside here the people’s eyes collide, telling each other a piece of where they came from, where they might be going. Moving out of the corner, we joined the others who seemed to be regular fixtures there, naturally in their place like the books on the shelves. Some drank beers while others ordered shots that insisted Viktor join them but no matter their drink of choice each had opened up more and more with each sip. All in all there were about ten of us who had eventually conversed and exchanged names and stories. At any given moment there was a wide variety of life lessons, experiences, or dreams to tune into. We had joined Marian, Carol, and Pete, three Slovakian photographers who shoot commercial products and beautiful women in a studio down the block, for a joint outside and laughed in the falling snow. Back inside, languages were spoken beyond the rulebooks’ limitations, rolling off tongues in sincere effort to share with a stranger what is stirring inside. One man, whose positions and gestures reminded me of a baroque statue, took twenty minutes and two beers to attempt to share his philosophy on life and living, when he finally managed to find the words that could have been the key to life itself: “the golden negative rule! Lady, you have to do unto others what you would want done unto yourself.” Feeling accomplished, he finished his last beer and disappeared into the snowy night, leaving nine of us inside giggling at his grand performance. As the music played and the hours slid by, I was no longer an outsider looking in, cheering our warm red wine to those moments we will remember across the oceans. 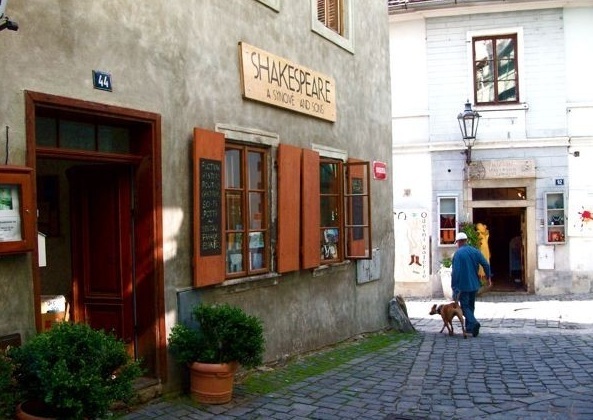 It was inside of Shakespeare and Sons that I saw Prague for the first time. There are no grand statues of bronze or iron, no castles and steeples to gaze upon, no cobblestone paths or even a big clock to tell us the time. That night there was no time. It would not be a place for “1, 2, 3 cheese!” smiles, or the image on the front of a postcard, but it reminded me so much of what I hoped to find away from home, on nights of wonder and excitement before leaving. A friend back home had promised me this, promised me that a place like this could show me more than the guide books ever could. Serena had been in my very position and advised me to seek it out, and I worried and nodded that I would try though it seemed to be an impossible notion. I spoke no Czech, I knew no stories or tales of Czech culture– I was just an American student trying to live out any student’s dream. But I felt welcome for the first time in three weeks in a place where I doubted my place, questioned my presence. And so Shakespeare & Sons offered me the experience I hoped to come across, unexpected and unwritten in my plan book. This was a guest post from D.S. Amar of I Must Be a Mermaid. She is a 27 year old writer, library school student, and novice herbalist who adores nature, stargazing, and travel. Have you ever had an experienced travel bliss? Posted in Czech Republic, Inspiration. RSS 2.0 feed. What about the civil war, etc in the area? Is Czech republic now a peaceful place & safe for tourists? The Czech Republic is definitely a safe place to travel these days! what you are talking about! Bookmarked. Kindly also visit my website =).